"There's part of me that goes out like I'm not done. Like, I wanna go win another one." 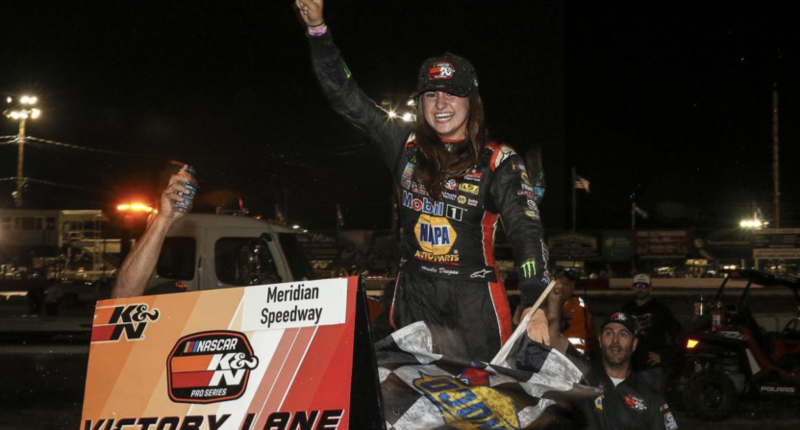 Hailie Deegan has had one incredible week. The 17-year-old who began her NASCAR career this year won her first race in Idaho. That was historic in that it made her just the second woman to win a NASCAR race in any series and first to win in the K&N Pro Series. I talked to Deegan this past Monday about her win and what all she has experienced since last Saturday night. Phillip Bupp: Congrats on the win, how have the last couple days been for you? Hailie Deegan: Oh it’s been crazy, thank you. PB: Has that feeling sunk in yet of what you’ve accomplished already? Deegan: It’s starting to but it’s still getting there. PB: Was there anyone who called or texted congratulations who might have surprised you that they reached out to you? Deegan: I mean it was really cool, I had Kyle Busch make a tweet about me, [NASCAR President] Steve Phelps tweeted about me. Just some heavy hitters in the NASCAR series are definitely key players, when they say stuff to people, they see it. PB: How did you celebrate after the race? Deegan: I mean, I went back to my hotel and kinda sat on social media and looked at everything. PB: Having fun doing that. PB: Where do you have the trophy right now? Deegan: It is in my apartment in North Carolina. I had to fly back with it from Idaho, I had to stop in Denver, it was an eight hour flight. And this trophy is really awkward, it’s like a really big bottom and a really big top. It’s really top heavy so it like falls over very easily. It’s like a water tower I think. It kind of looks like a Mento with stick, but it’s kinda like an awkwardly … I mean it’s kind of easy to hold ’cause it has like a giant like handle in the middle, but it’s definitely a heavy trophy to bring all the way back from Idaho. PB: Did you get any looks at the airport lugging that thing around? Deegan: I had a lot of people asking me what is that. I had to tell the same story. I had like a straight elevator pitch of what this trophy was. PB: Now, you’ve received a lot of media attention over the past few days, and not only media attention in sports but mainstream media attention, which is kinda tough to do with football going on and even in NASCAR because of the Roval this past weekend. Were you surprised, amazed, humbled by all the media attention you’ve gotten over the past few days? Deegan: Yeah, it’s funny because everyone’s like, “do you feel just so bombarded with all this media?” But it’s really a privilege to have all this. Drivers dream about having this type of media, and getting these types of opportunities, and I’m just, I’m really just blessed to have all this going on, and being able to have all these opportunities for me to make this reality come true. PB: And I know today, you spent most of the day doing media commitments, it’s gotta be a learning experience for you because if you’re gonna move up through NASCAR, this is part of the thing that you gotta do is media commitments, and maybe a few hours or a whole day blocked out for media commitments, so that’s probably gonna be good for you. Deegan: Yeah anything that helps my racing career, I’m down to do. PB: Now that the K&N Pro Series West is wrapping up, there’s a couple races left. What’s on tap for you for the rest of the year and do you know what you’re gonna be doing for next season? Deegan: Ah man, the rest of the year we’re just gonna try and get through these last two races. Hopefully we can…I think Roseville, that’s definitely gonna be a tough race. I haven’t really been to Roseville, haven’t done a lot of racing at Roseville, but Kern [in Bakersfield] I have a little experience on, and I feel like we could really do good at Kern. PB: Do you feel the pressure has kinda lifted off you now that you’ve won? Deegan: Yeah in a sense, it’s kind of like a little breath of fresh air now that I’ve got all my goals accomplished for the year, but now there’s part of me that goes out like I’m not done. Like I wanna go win another one. PB: Yeah, you gotta set new goals now.